There’s no denying that the nature of reading is shifting, and that goes for the classroom, as well. This is where the iPad comes in. Everything from cookbooks to the Bible can now be downloaded and read in digital format. The iPad represents one of the first fully featured mobile computers that also doubles as an excellent reading device. It’s extremely simple to purchase and download books that can be read on your iPad and transferred to other devices. You have a selection of many excellent reading apps for the iPad, including Apple’s iBooks app. Apple aptly describes iBooks as both a way to buy books and to read them. It connects directly to Apple’s iBooks Store, where you can purchase and download books. Downloaded books are stored in the iBooks bookshelf on your iPad and opened for reading with a simple tap on their cover. Tap the iBooks app icon on your Home screen and you’ll see a bookshelf with any books that you have downloaded. Tap any book to open it and start reading. 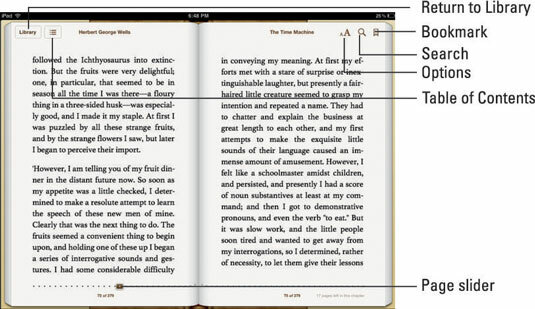 Now before you wiggle your way into a comfortable reading spot on the couch, let’s look at some adjustments you can make in iBooks to enhance your reading experience. Selecting a color theme: Themes change the color scheme to match the needs of different lighting settings. Select from White, Sepia, and Night. Adjusting brightness: Set the Brightness slide control to the level that makes it most comfortable for you to read. Choosing font size: Under the Brightness slider are two buttons with the letter A. As you tap the smaller A button on the left, the text gets progressively smaller. Tap the larger A and the font size increases. Picking your favorite font: Tap the Fonts button to change the text font. Experiment and find the one that makes it easiest for you to read. iBooks remembers your settings each time you use the app. Don’t think for a moment that all you can do with iBooks is read books. Bookmarks: No need to tear strips of paper to keep your place. iBooks remembers where you left off every time you open it. You can also add a bookmark to any page in the book you want to remember. Tap the Bookmark icon in the top-right corner of your page, and a red bookmark slides down. Tap it again and it disappears. To find your bookmarks, tap the Table of Contents icon and tap the Bookmarks tab to view the list of bookmarks you added. Highlights: Highlighting text in iBooks is similar to selecting text in any editor on the iPad. Tap and hold any word for a second. When you lift your finger, the word is highlighted with a shaded box that has grab points in the corners. A pop-up menu offers options that include Highlight, Note, Define, Search, and more. Drag the grab points out to highlight the area of text you want to highlight. Tap Highlight and select a highlight color from the pop-up menu of choices. Notes: Are you the sort of reader who fills the margins of your favorite books with comments? Thankfully, that’s a feature you can also access when using iBooks. Tap and hold to select text on the page, and then tap Note on the pop-up menu. Type your notes in the little sticky note that pops up onscreen, and your note will be saved right where you left it. Access your highlights and notes in the same manner as you got your bookmarks. Go to the Table of Contents and tap the Notes tab at top. The Notes tab includes text you highlighted throughout the book along with any notes that you added. Your Table of Contents becomes the central navigation point for everything in the book. Word definitions: One of the nicest features for students using iBooks is the capability to easily access word definitions. Tap and hold to highlight any word, and select Define from the pop-up menu. That’s a lot simpler than hauling around that huge and heavy dictionary, don’t you think? Note that the first time you select Define, it responds that no definition is found. You need to tap the Manage option and select the dictionary to use. iBooks is also a great way to store and organize your PDF documents. Anytime you’re viewing a PDF, whether in Safari, in Mail, or in one of the many other apps that can display PDF documents, you have an option to open the document in iBooks. It’s automatically added to your PDF Collection and can be saved and accessed at any time through iBooks. This can be an effective way to deliver content to students. 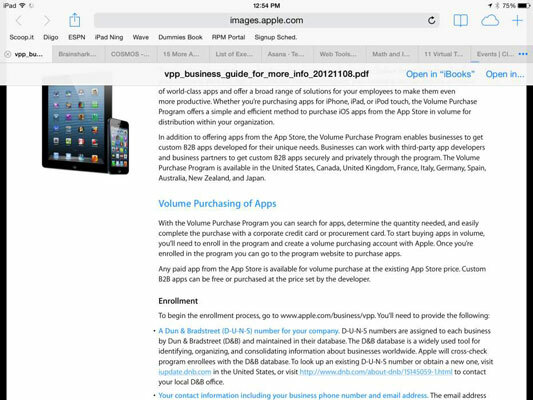 Email a PDF or place it on a classroom website, and have the students open and save it in the iBooks app. Many other apps also enable you to open, save, and annotate PDF documents. 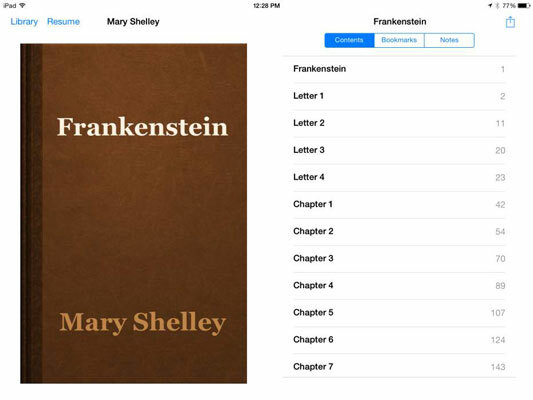 When you first open iBooks, you’ll notice it has two collections — Books and PDFs. Think of a collection as a bookshelf. It’s simply a group of books or content that you can set up and keep organized. 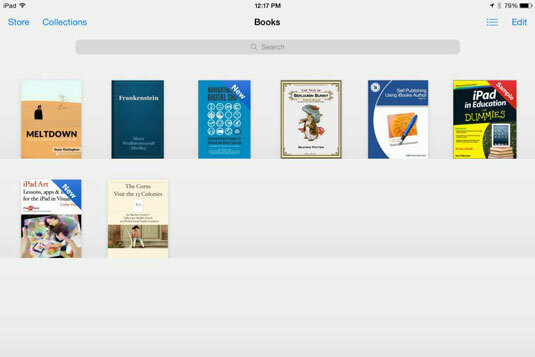 Tap the Collections button on top of your iBooks bookshelf to add and edit your collections. You can also move books and documents between collections by tapping the Edit button in the top-right corner, selecting the content, and tapping the Move button that pops up on the left of the top toolbar.